MacNeice and his team hunt a sophisticated serial killer who draws his inspiration from classic works of art. Two bodies have been found in the master bedroom of a mansion in Dundurn’s old-money neighbourhood under the mountain. Howard Terry and his son, Matthew, have both been shot twice in the chest. Under Matthew’s body is a doll with blood-red cotton wadding spilling out its head. Nearby, a mannequin in a nightshirt lies on its back, with two bullet holes in its chest. On the other side of town, a body is discovered below the Devil’s Punchbowl waterfall. Leaning against an enormous rock is a man in a cotton nightshirt wearing a paper mâché donkey’s head. Two rounds in the chest. 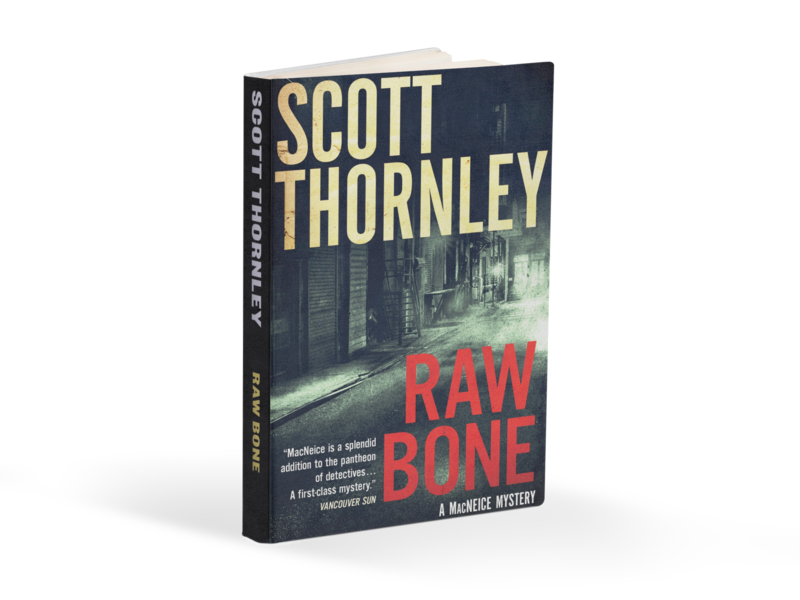 In the third novel of Scott Thornley’s much-praised MacNeice mystery series, Detective Superintendent MacNeice’s life—and heart—are in serious danger. On a morning with just a hint of spring in the air, the body of a young woman is found trapped in the ice of Cootes Paradise on Dundurn Bay. She has no piercings or tattoos or nail polish, and is as pristine as if she’d stepped out of a more innocent time. The next day at dawn, in Gage Park in the heart of the city, a homeless man is woken by the sound of squeaking wagon wheels and spots someone abandoning what looks like a bundle of silvery garbage in the middle of a grassy lawn. Then he realizes that the bundle is actually a man, gagged and duct-taped to the wagon but still alive. It turns out that the man is booby-trapped, rigged to blow as soon as the emergency personnel attempt to cut him loose. And MacNeice is faced with the gruesome murder of another apparently innocent victim, a blameless and bland high-school teacher and devoted single father whom it seems, nobody could summon the energy to hate. The investigations lead MacNeice and his team into the bars and rooming houses of Dundurn, where Irish immigrants intersect with mercenaries and criminal gambling racketeers. Soon MacNeice himself is a target, along with the first woman he has allowed himself to touch since his wife died. And then he discovers that the worst crime of all is one hidden in the secret life of that oh-so-normal high school teacher. 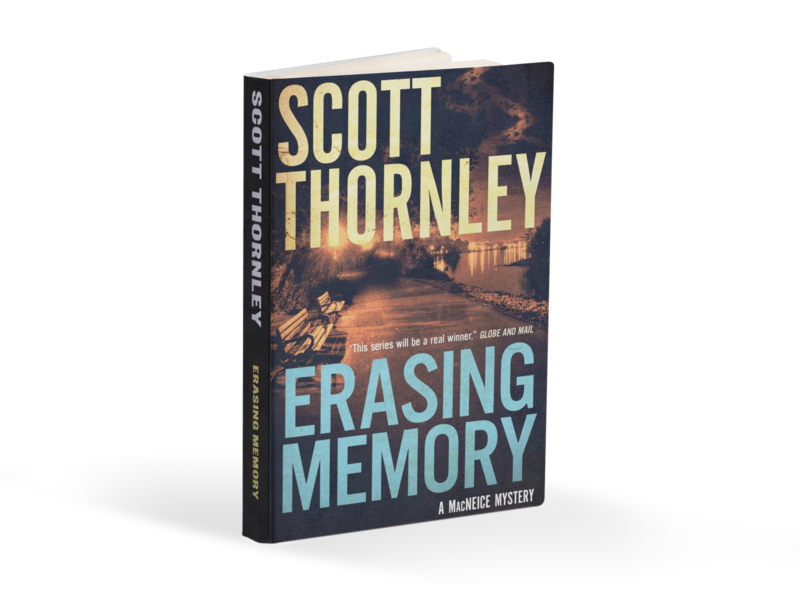 The eagerly anticipated 2nd book in his MacNeice series from acclaimed crime novelist Scott Thornley. If a local biker war isn’t enough — 7 shrink-wrapped corpses found buried between the barns on a nearby farm —MacNeice receives a desperate phone call from his old friend, the mayor of Dundurn. Dredging is nearly completed on the ambitious waterfront project the mayor hopes will revive his mini rust belt of a city, but the whole thing may be about to come off the rails: the dredgers have turned up 6 more bodies at the bottom of the lake, and 2 of them, encased in concrete, are fairly fresh. The mayor wants MacNeice to fix things, discreetly and fast. 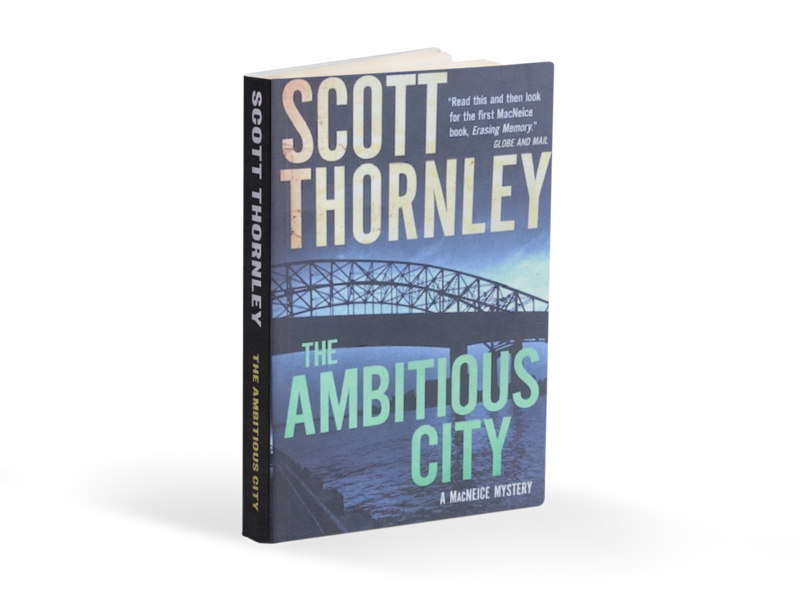 The trouble is there is another “visionary” on the loose in Dundurn, a serial killer who wants to rid the city of high-achieving young women of colour. With the body count rising, the usually super-competent Detective Superindent MacNeice feels outgunned by the bikers, outmaneuvered by the serial killer–and deeply unsettled by the connections he begins to uncover between the biker wars and the US and Canadian concrete companies who’ve won the bid to help build the mayor’s dream. The only good thing about the crisis is that he’s persuaded Fiza Aziz, the young Muslim detective who’d burned out on their last case together, to come back to the force. The bad thing: she deliberately puts herself in the killer’s sights. 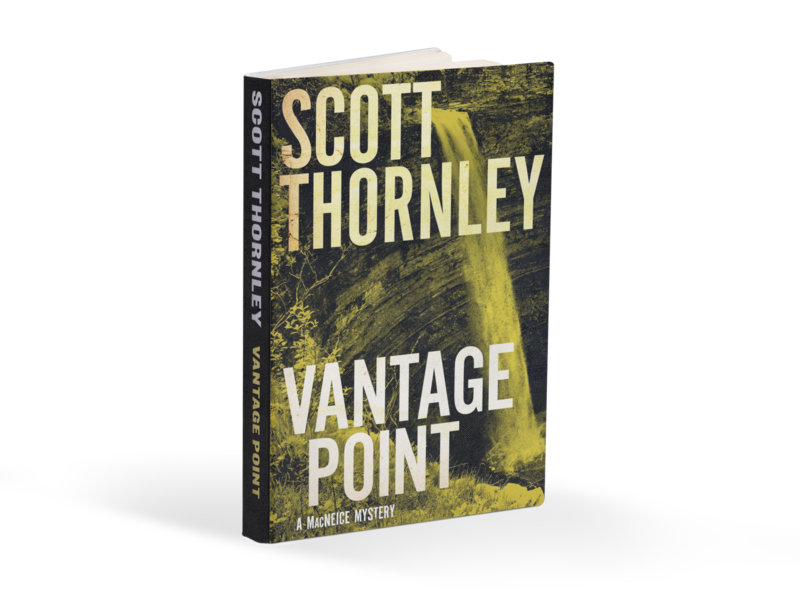 MacNeice, a senior police detective in the southern Ontario industrial city of Dundurn, is returning from a pilgrimage to his wife’s grave when he’s called to a crime scene of singular and disturbing beauty. A young woman in evening dress lies gracefully posed on the floor of a pristine summer cottage so that the finger of one hand regularly interrupts the needle arm of a phonograph playing the Schubert Piano Trio. The only visible mark on her is the bruise under her chin, which MacNeice recognizes: it is the mark that distinguishes dedicated violinists, the same mark that once graced his wife. The murder is both ingenious and horrific, and soon entangles MacNeice and his team in Eastern Europe’s ancient grievances, which reach out to breach all the walls that have been thrown up to keep the past at bay. MacNeice must use his splendid but unorthodox powers of observation to stem the tide of events threatening to erase any trace of memory or history, leaving the target of the crime naked in the face of loss.